Private and centrally located loft - perfect for your Leelanau getaway! Brand New to VRBO! 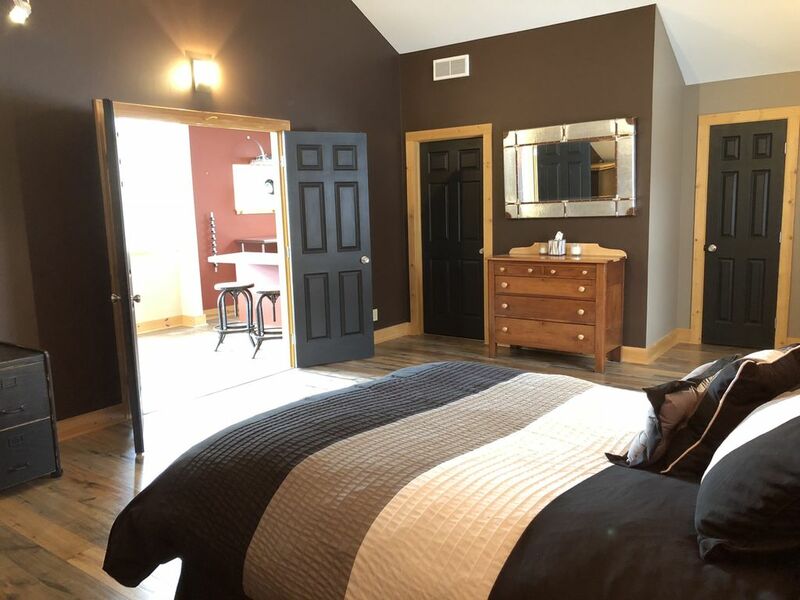 Located in the heart of the Leelanau Peninsula, the Leelanau Loft is on the second floor overlooking the park. A large master suite opens up to the bright and sunny living and kitchen area. The kitchen is very well equipped for anyone who would like to stay in rather than dine out. The location is perfect - with a grocery store, winery and 2 restaurants literally right around the corner! You can rent a boat in Lake Leelanau for the day, explore the Leelanau Wine trail, bike the new trail to Glen Arbor and so much more! This property is great for young families. The large master suite features a queen size bed with a new mattress set as well as a large day bed and trundle bed. With the quiet park right across the street, the kids will have plenty of room to play! The master bathroom features a large shower, single vanity, toilet, and linen storage. There are parking spaces available and you may use the garage to store your bikes or other small recreational equipment. Large living area with a comfortable leather couch, TV, and a desk space. Basic pantry items including oils, vinegars, spices, sugar, etc. Full kitchen with everything that you would need to cook a lovely meal. There is also an outdoor grill and outdoor dining area. Counter top with 2 bar stools and an outdoor dining area as well. Small deck by the grill. There is a public tennis court across the street. Really nice decor. Super comfortable bed. Kitchen stocked well. Just right for our stay on the Leelanau Peninsula. Felt chilly when we first arrived but turned on the space heater and that was perfect. Temperature controlled by main house. House faces main road but excellent parking behind. Get explicit directions as it is a little confusing where to park and enter since it is 1/2 block off main road. Would recommend this rental. Very comfy. Very comfortable and spacious loft. Stayed an extra couple of days to enjoy the Traverse City area. The loft was close to all venues and had a chef inspired kitchen, spacious bedroom and large closet. Agree with previous notes that the portable heater should be mentioned in the life's documentation. The property met our expectations. The only issue we had was locating the heater and that probably should be included the information on the counter. Cute loft for a great weekend away! Great location to stay when wanting to check out all of Leelanau and the surrounding areas! Great cozy loft apartment. Perfect for couples. The loft was perfect. It has all the amenities you need to have a great romantic weekend. Small, but intimate and well furnished with plenty of kitchen gadgets and comforts. Clean, simple, modern with comfortable seating, a good bed, complete kitchen, tastefully decorated... nice place.